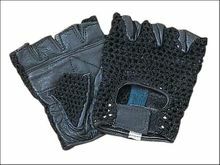 These bike gloves are half finger style with cotton knitted, mesh, back (see through) and leather palm. Padding is very light. Velcro closure for snug fit. All black.